Today we have one of my favorite dinner recipes. It may not be pretty but it is tasty! 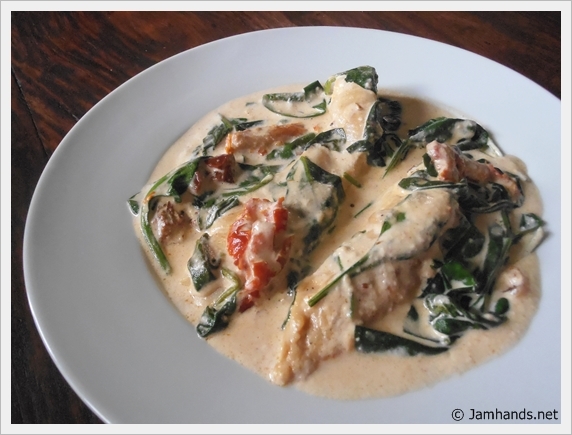 A cream based spicy sauce is mixed with sun dried tomatoes and fresh spinach to wilt it, then combined with tender pieces of chicken breast. So although this recipe has a long name, it is super simple to make. The level of spiciness is up to you. As the recipe is now, it has a little bit of heat. I like to add another pepper with extra Adobo sauce to really spice it up. If you are unsure, start with the called for amount then add more if you'd like. Remember, it is a lot easier to add heat than it is to take it away. The second time I made this I added in sun dried tomatoes for a little extra flavor, but if you find yourself not having any at the last minute, it tastes great without them too. 1. If you have not done so already, cook the chicken tenders. Set aside. Be careful not to overcook them, you want them tender and not super dried out. 2. In a large sauce pan, add the cream to the pan. Add in chopped sun dried tomatoes and the Chipotle and Adobo sauce and stir to combine. Bring barely to a simmer. Add the spinach to the hot cream and it will quickly wilt. Pour over chicken and serve. i really don;t like when a meal is SO good but doesn't photo well:( Your chicken looks great. That looks amazing! Seriously, I am drooling over here. :) I can't wait to try this. Thanks for the recipe! what kind of cream did you use for your sauce? I have used half and half or a heavier cream and it works out great either way.